Knitted item’s are beautiful, but as someone who has only mastered crochet, that makes me sad. If you are like me and just cannot work with two needles and want to stick with your single hook, yet love the look of knit, we are in luck! This faux knit stitch (which is SUPER easy) can only be worked in the round if you want to stick to just basic HDC, which is my favorite stitch if you couldn’t tell from looking at other patterns. Stick with what works right! The good news is that a stitch that can be worked in the round is perfect for making an infinity scarf! This pattern works up relatively quickly and the end result is gorgeous!!!! You can get the AD-Free PDF of this pattern from my Etsy Shop for $3. Yarn: I used a single cake of Caron Sprinkle cakes/Caron tea cakes yarn for this faux knit scarf, which I purchased at Michaels. They are normally $9.99 but with black friday coming soon and pre holiday deals I was able to snag my for around $5.50 with coupons and sales! 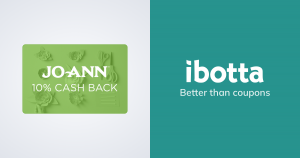 Below are some other substitutes you could try! Crochet Hook: I used a 12mm Clover Brand Hook. Single Crochet (SC) – Insert hook into next chain/stitch and pull up a loop. YO and pull through both loops on hook. Knit Half Double Crochet (KHDC) – This is a normal HDC stitch but you work through the third “back loop” of the previous row instead of the normal top two loops. 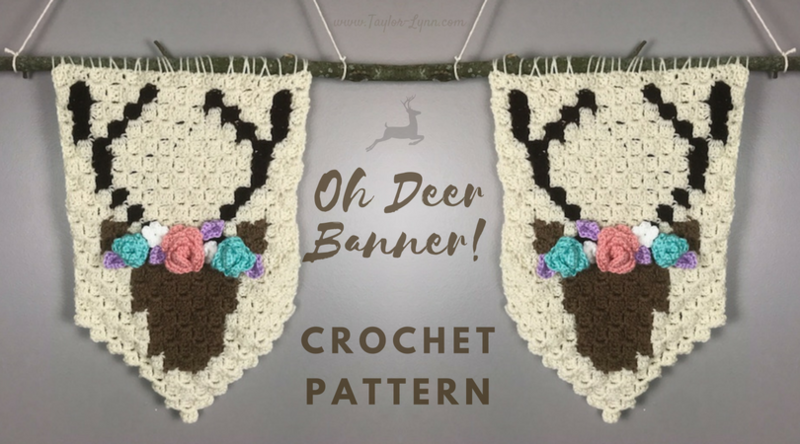 If you love this pattern, you may want to check out my Oh Deer Wall Banner pattern! PS if you just want to see how the “faux knit stitch” is made jump to about the 4 minute mark on the video! CH 90. SS to first CH. Round 1: CH 1. HDC in next CH. HDC in each CH around. Do not SS to first CH. We will work in a spiral, continuously working without starting and ending the rows with a SS and CH as you normally would. Round 2-12: continue by working a HDC in the CH1 we did at the beginning of round 1, then KHDC in each ST around. Continue making KHDC rows in a spiral until you have 12 rows. Round 13: You should be roughly at where you started row 1 (note where your tail of your project is hanging at) Make a SC in the next two stitch in the same loop you did for the KHDC, then make a SS in the next two STs. Tie off. Tie onto any stitch and do a row of SC around the scarf and SS with the first SC, along the top and bottom of the scarf for a more even, finished edge, if desired. Below is what your finished Faux Knit Scarf should look like! Fake it until you make it…. or learn to knit. 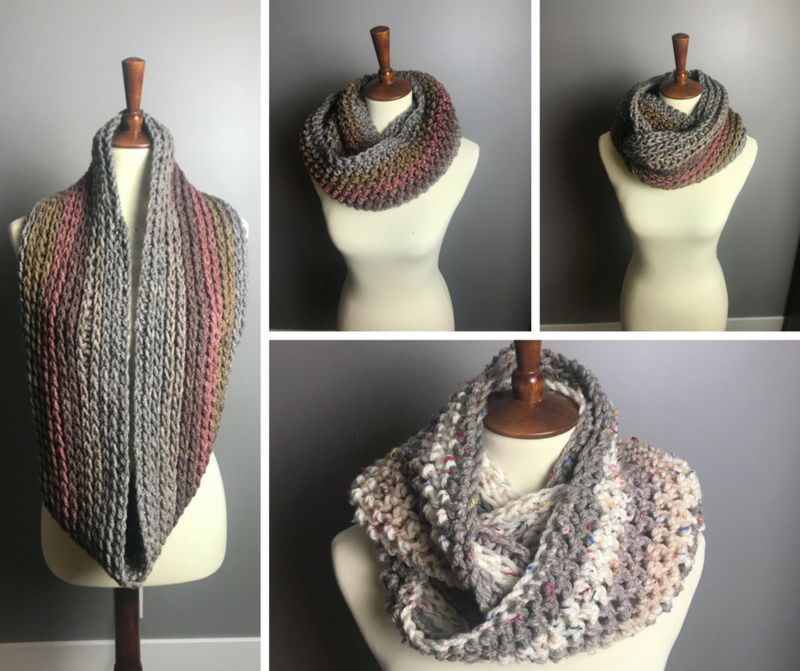 It’s almost as good as learning a new yarn craft, except without all the learning a new yarn craft part 😉 It is a gorgeous scarf that is just as pretty to look at as it is warm. I don’t think I will use any of my crochet things as much as I plan to wear this scarf. The Caron Cakes were a gem to work with and I cannot wait to find more patterns to use them on! 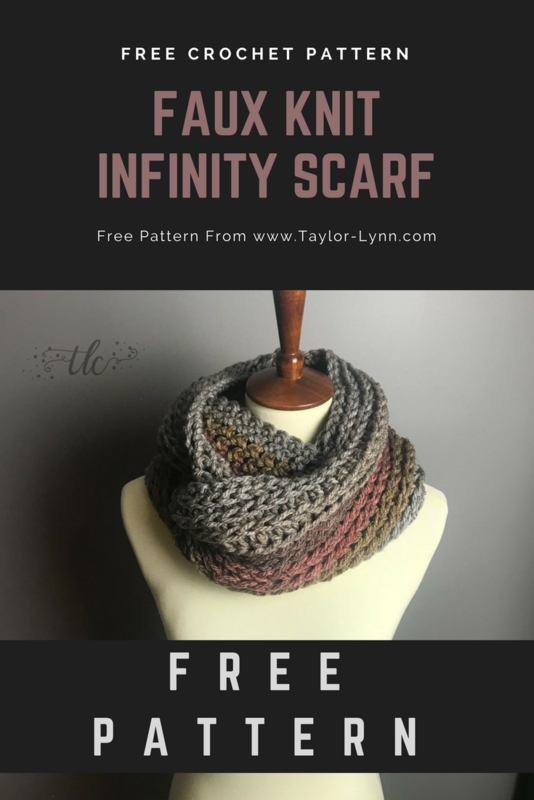 If you have ANY QUESTIONS about this faux knit stitch infinity pattern, or about anything other crochet topics, please please leave me a comment below and I will get back to you ASAP! Also, if you would be willing, I would love for you to share your finished projects (and you wearing them doing fun fall/winter things!) on my blog’s Facebook Page! Or if you post on Instagram tag me (@TaylorLynnCrochet) so I can see how awesome they turned out! The social media icons in my header and side bar are all linked right to all of my accounts! Thank you so much! If you have any suggestions for future or tutorials please comment below! Thanks for your story; I appreciated that. When I was in college art class, (about 40 yrs ago-no kidding!) I crocheted a belt because my “art” skills were – and are – about 2nd grade level. It was pretty primitive but it worked. And, these were the hippy days after all. I wore it with a pantsuit that I made; it was horrible and something no self-respecting woman would wear today. Thanks for your hard work and great projects; it must take you HOURS to put this all together! I’m sure many of your fans appreciate that. Incidently, you are GORGEOUS as well as talented. You’ve probably noticed that. What an easy and fast stitch! Thanks for the pattern. The only thing I would recommend is maybe including how many skeins needed if not using the Caron cakes/rolls. I picked up 2 skeins of the Hometown and I am going to run out about 2/3 through. My neighbor wants me to teach her to crochet because she saw the picture on your blog of the scarf. So you have inspired a new crafter! Your video is great and the stitches explained very clearly! Thank you! I’m planning to make my scarf with Lion Brand Landscapes. The coloration is called Wild Flowers. Thanks again for a very well done video. I’m a visual learned – so it was most helpful. glad you found it helpful! I am a visual learner as well so I now exactly what you mean! Love your scarf! My daughter would like for me to make her one but wants it to be straight and not infinity. I’m afraid by turning it at the end of rounds and not doing the work continually that it may not turn out right. Would you know if it would look the same either way? Thank you! Unfortunately this specific stitch can only be made in the round unless you want to tie off and the end of each row, then tie back on at the beginning of the row and stitch in the same direction as the previous row. Did you use the whole skein of sprinkle cakes or did you still have any leftover? 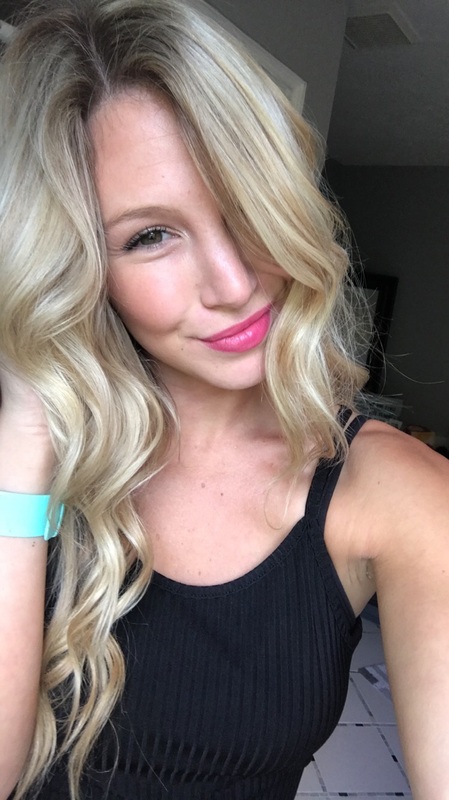 Hiya!! I accidentally picked up super bulky (6) yarn in stead of chucky (5). But I also went to the craft store and they only had 10mm hook so do you think the gauges would be about the same? Do you have a gauge for this pattern? I can’t wait to make it! !